The political crisis that threatened to paralyse the central Asian republic of Kyrgyzstan has been resolved. Since protests toppled President Askar Akayev last week, two rival parliaments - the outgoing assembly and the new - have vied for legitimacy. But on Tuesday, the upper house of the old parliament dissolved, following the example of the lower house on Monday. It said it wanted to ensure stability. The new interim President, Kurmanbek Bakiev, praised the assembly's action. "You have taken the right and historic decision," said Mr Bakiev. "I hope your decision will bring calm." It was controversy over the polls which saw the new house elected that fuelled last week's popular uprising. In the immediate aftermath of the protests, the Supreme Court annulled the poll results and said the previous parliament had authority. 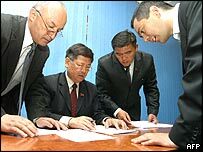 But Kyrgyzstan's electoral body backed the new assembly. Mr Bakiev had initially supported the old parliament, but switched his support to the new as it pronounced him prime minister. He had already been designated interim prime minister, but this move further boosted his legitimacy. Mr Bakiev has said he wants to hold presidential elections in three months' time, but the Speaker of the new parliament says such a vote could only be held after talks had been held with Mr Akayev, because he had not formally resigned. It is not clear where Mr Akayev is. Mr Bakiev has said he would enjoy all appropriate legal and constitutional guarantees if he returned to Kyrgyzstan.